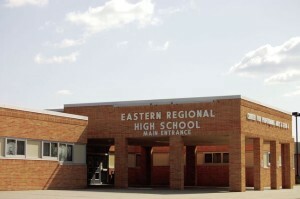 Students at Eastern Regional High School who need extra help understanding a difficult concept in a class or preparing for a test can always find assistance with Eastern’s Academic Support Program. Held after school on days when late buses are available, the program attracts about 30 students a day from all academic levels to spend time with teachers and get individualized help in subjects such as math, biology, chemistry, English, social studies, physics and world languages. At the most recent meeting of the Eastern Camden County Regional School District Board of Education, teachers from the program gave an overview of the program’s success. Program coordinator and social studies teacher Maryann Walker said for the past six or seven years, the program has grown into almost its own community, and has earned positive reviews from many at the school. Walker read testimonials from several staff members, including guidance counselor Sheri Lattimer who wrote she always encourages students to use the supports offered by the program, and English teacher Christine Leason who wrote it was important for students to have the opportunity to conduct one-on-one conferences. “Seeing the same student transform from confused to confident feeling 100 percent better about their academic abilities is priceless,” Leason’s letter stated. The program’s other coordinator, science teacher Zabrina Thompson, said this year’s program has more than 30 teachers involved and has helped up to 250 students thus far. Thompson thanked the board for its continued support of the program, which she said has been invaluable over the past several years. Regina Bosworth, a math teacher involved with the program since its inception, said the program was especially great for students in math, which she said tended to be a heavily populated subject matter for students looking for assistance. Bosworth also noted that the National Honor Society tutors are also involved with the program every day should math teachers be busy or have a big group of students seeking help. Science teacher Tracey Wojdon-Smith, who has also been with the program since the beginning, said another benefit is if students don’t understand the way their teacher explains something in the classroom, different teachers are involved with the program to explain things a different way. Wojdon-Smith said she recently suggested such to even her own students after she taught a particularly difficult concept and wasn’t available after school herself. “Go and see another teacher who might explain it slightly differently and then they can get it,” Wojdon-Smith said. Superintendent Harold Melleby Jr. said he wanted to thank all teachers involved with the program for their efforts and commitment, and noted he had observed the popularity of the program firsthand.